Carrot Coffee Cake is a wonderful mix of carrot cake and coffee cake. It has plenty of carrot flavor (just look at that gorgeous color!) and lots of cinnamon and nutmeg flavor. It’s perfect for an Easter brunch or any spring breakfast. Who doesn’t love coffee cake? I mean, just the fact that it legitimizes eating cake for breakfast makes it pretty awesome in my book. 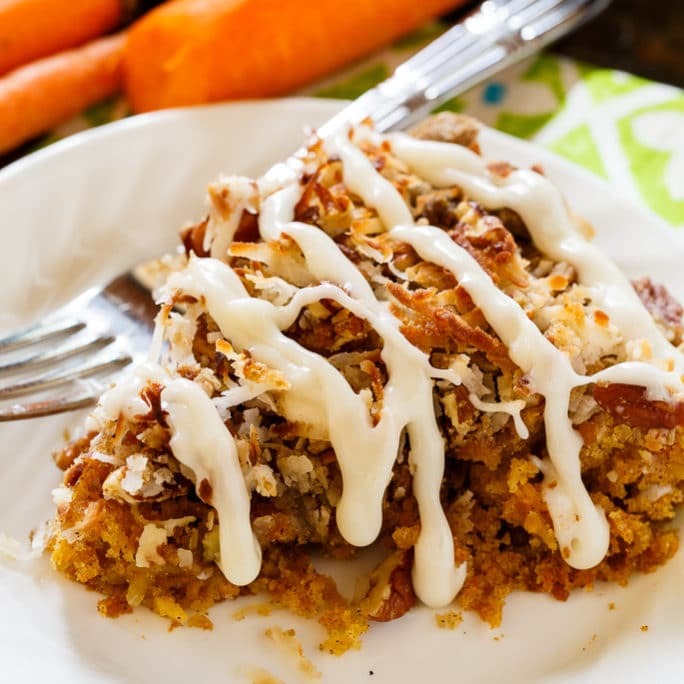 A slice of this Carrot Coffee Cake with a cup of coffee is surely a great way to start the day. I like to bake my coffee cakes in a 9-inch cast iron pan, but you can use a 9-inch cake pan. Vegetable oil and crushed pineapple keep this coffee cake perfectly moist. 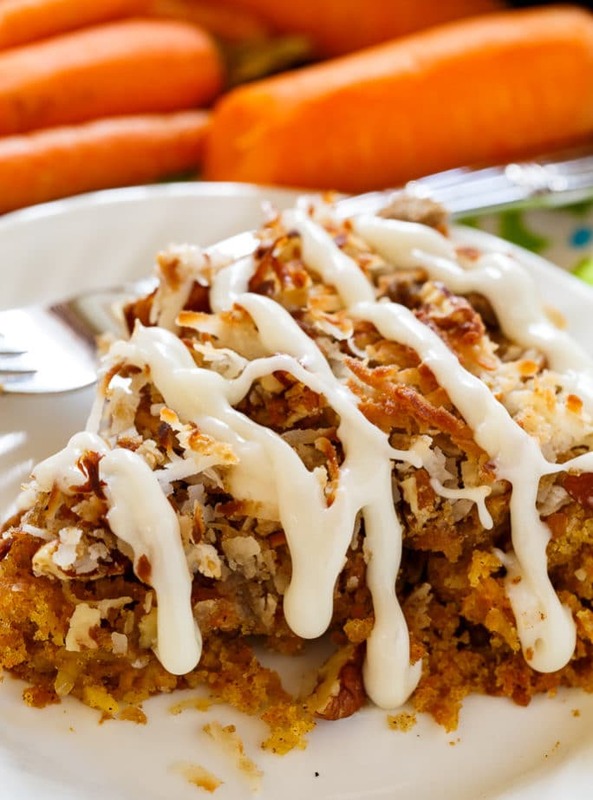 Carrot Coffee Cake is a wonderful mix of carrot cake and coffee cake. 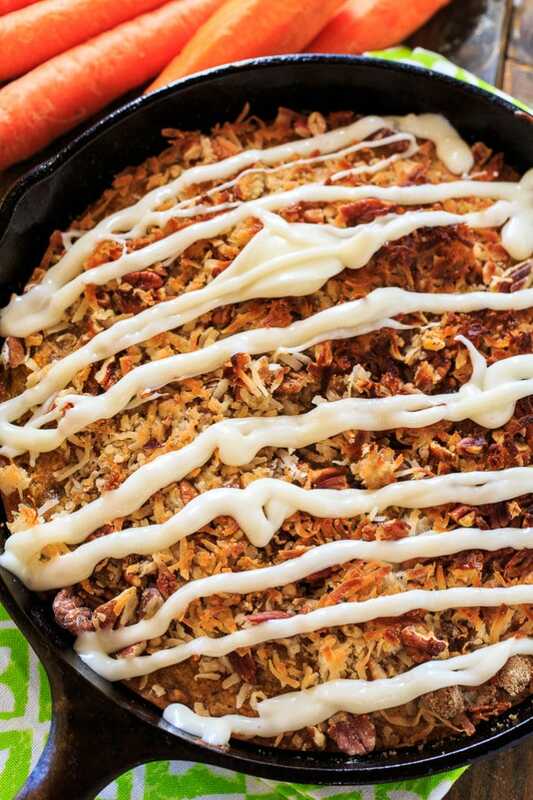 It has a thick cream cheese glaze and a coconut and pecan crumb topping. Preheat oven to 350 degrees. Spray a 9-inch cast iron pan or a 9-inch cake pan with cooking spray. In a medium bowl, whisk together flour, cinnamon, nutmeg, baking powder, and salt. Set aside. In a large bowl, whisk together oil, both sugars, eggs, and vanilla extract. 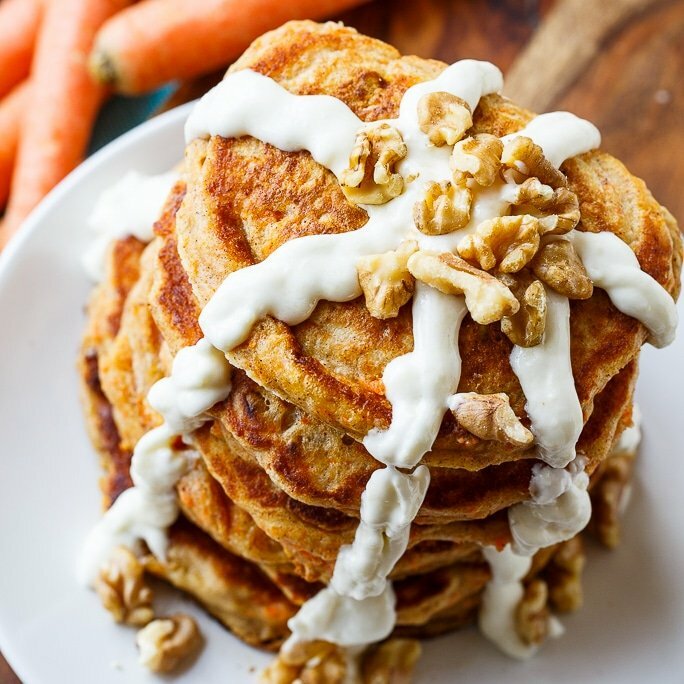 Fold in carrots, pineapple, pecans, and coconut. Pour into prepared pan and bake for 25 minutes. While the cake is baking, make topping. Stir together all ingredients in a medium bowl. When coffee cake has baked for 25 minutes, remove it from the oven and sprinkle with topping. Return to oven and bake until a wooden toothpick inserted in center comes out clean, about 10 minutes. While coffee cake is cooling, make glaze. Use electric mixer to beat cream cheese, milk, vanilla extract and powdered sugar until smooth. Adding powdered sugar gradually will help keep it smooth. 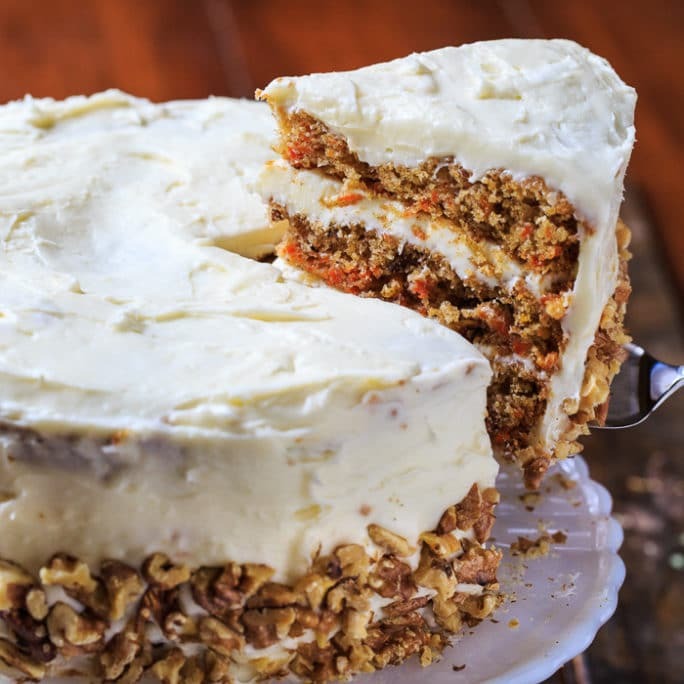 This entry was posted in Breakfast and tagged carrot cake, coffee cake. Bookmark the permalink. 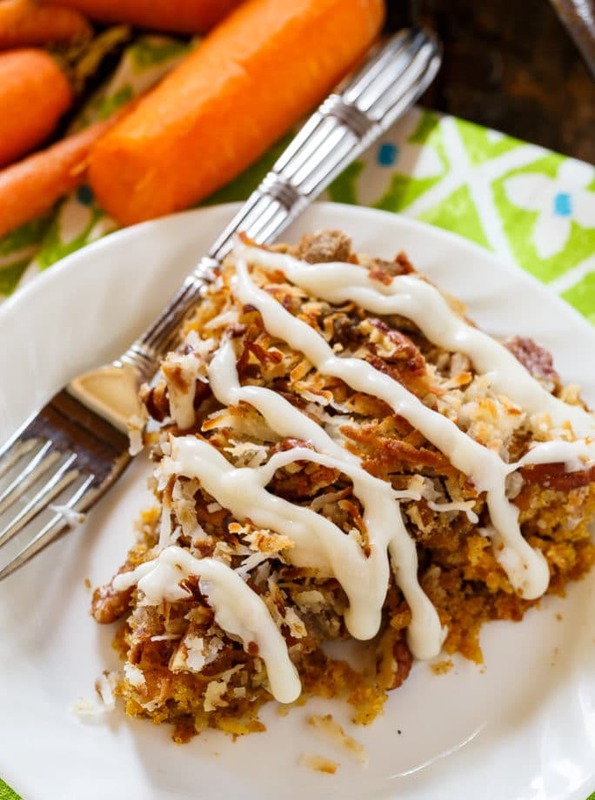 My sister and I absolutely loved this Carrot Coffee Cake!!! I kept forgetting that it is for breakfast, but it felt like eating dessert. I will definitely make this very delicious and decadent cake again!!! What an interesting mixture of ingredients, I had never heard about this kind of cake before! I love experimenting in the kitchen just as much as you do, so I hope I can get this one to work, cause it sure looks yummy! Carrot cake is my favorite! I’d love a big slice to go with my morning coffee!